​ Your English Bulldog is a strong and powerful dog which requires special control. You know, dogs are animals and sometimes, despite of their upbringing, they can behave aggressively (for example if you are walking with your doggie in crowded place and he is afraid of something like noises). That's why you should care about safety of other people and that's why there is a law that prescribes you to muzzle your pet while walking with him. And we want to help you to solve this problem, because a high quality muzzle shouldn't limit your pet's freedom. Our webstore is glad to offer you a variety of different muzzles that will help you to control your pet better, to avoid unpleasant situations on the streets, to train him more effectively and to provide him with comfort, safety, style and reliability. 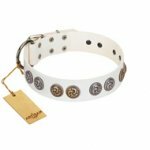 So, If you want to express all your love and care to your pet, choose only high quality equipment for him - and he will give you all his devotion in return! 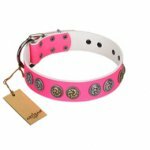 You need a muzzle that won't harm your pet during cold weather? 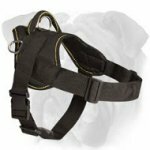 Choose one of the excellent Nappa padded muzzles. 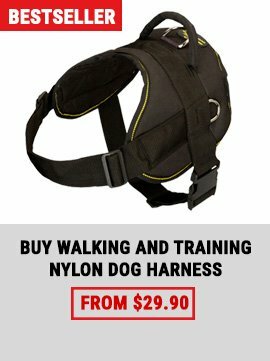 You need a muzzle that will help you to train your dog effectively? A wire cage muzzle will help you to do this. And if you want the muzzle to become a stylish accessory that will decorate your dog, we also have such models? Choose one of the stylish basket leather muzzles! 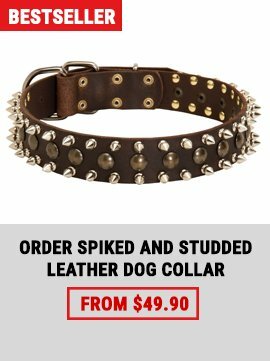 This is a spiked collar for dogs with attitude. 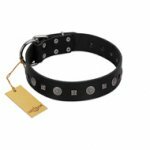 The collar is made from high quality materials, with nickel plated hardware and brass studs. It is powerful and strong, just like your Bulldog! 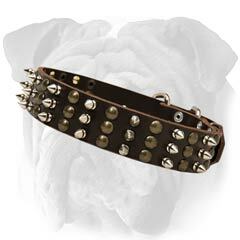 Get this Amazing Spiked Bulldog Collar - and you won't be disappointed! 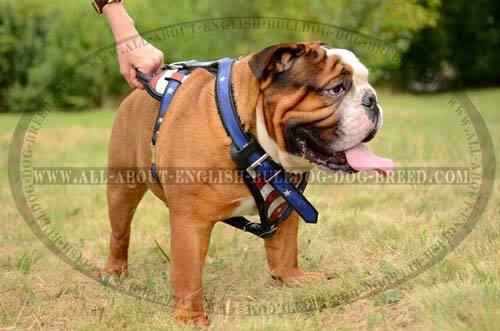 We are glad to introduce you our Pulling Leather Harness for English Bulldog. 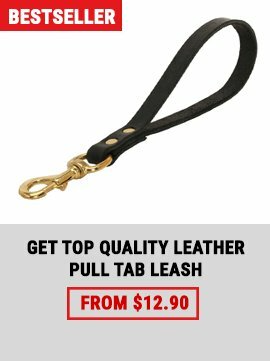 With a help of this harness a daily training of your pet will be pleasent and joyful. It’s a good chance to point your dog out among other dogs.